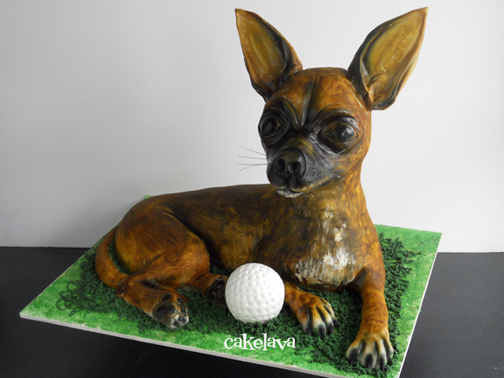 Rick loves making the sculpted dog cakes and I always enjoy seeing how realistic they turn out. Having been a dog owner ourselves, we have a special appreciation for these cakes, and know how important it is to capture the personality of each client's special pet. Our bride Ashley asked Rick to make her and her fiance's pet Chihuahua named "Peeta". The cake would be a surprise for the groom on their wedding day. Rick sculpted "Peeta" out of chocolate cake. He added a golf ball in front of the dog to tie in the groom's love of the sport. Congratulations to our couple! Summer really flew by this year! When we weren't traveling or meeting book deadlines, we were making and delivering cakes, like this bright and whimsical wedding cake and "sharp" looking groom's cake for our couple Lisa and Kent. Lisa and Kent have a real sweet tooth and even based their wedding theme on their love of candy. Their wedding colors were inspired by brightly colored candies with accents of chocolate. 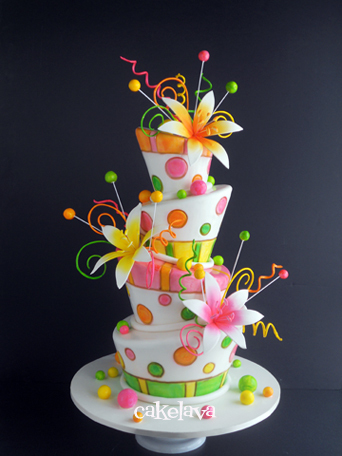 When we met with the couple earlier in the year, they requested a fun, flamboyant, brightly colored topsy turvy style of wedding cake with playful wire pieces coming out of it. They left the design in Rick's hands and he designed the cake with their candy theme in mind. When they saw their sketch, Lisa and Kent loved it and Rick was excited to make it! Not surprisingly, their cake flavors were two of our sweetest, Peanut Butter Fudgey, and Kona Toffee Crunch. Kent is a huge fans of Reese's Peanut Butter Cups and this flavor and the Kona Toffee Crunch which has candy toffee pieces was a perfect choice for both of them! 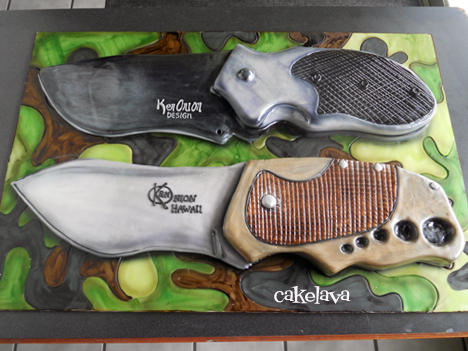 During the time Rick was designing their wedding cake, Lisa contacted us requesting a surprise groom's cake for Kent. She shared with us that Kent's new obsession was knives, specifically, local knife artist, Ken Onion's beautiful pieces. She gave us photos of Kent's favorite Ken Onion pieces and two were selected for variety. She asked that Rick incorporate camouflage into the design, so he placed the knives on a hand painted camouflage board. She chose a banana cake flavor for Kent's special surprise cake. When we delivered both cakes to the hotel, we knew their guests were in for a special treat. The room was decorated with brightly colored stripes and polka dots, and there was a candy bar prominently on display. The wedding cake was brought to one side of the room and the groom's cake to another area of the room, which we affectionately called "The Man Cave". The knives cake looked right at home with photos of the groom, including one of him and Rhianna, who he apparently has a big crush on because there was a life size Rhianna cut-out figure flanking one side of the table. We also heard the knife designer Ken Onion would be attending the wedding. We knew the knives had to look just like his beautiful creations. No pressure there! Congratulations to Lisa and Kent! A big thank you to them for including us not only in their special day but also for inviting us to their "Mahalo" party they threw for their wedding vendors and close friends. What a SWEET couple! !